My good friend, Michelle, is THE party gal. I like to throw a soiree and relish in the details that make it special, but Michelle puts me to shame. She is the best and carries every last element to the end. If ever I am stuck she is the one I call on to help me through a party dilemma. I think she's my crafty soul mate. If you are on the short list for one her shindigs it's always a great experience. For those of you who aren't I am here to share some of her fantastic creations starting with her son's summer birthday party invitations (she really should have her own blog...she's quite inspirational). Imagine you are 7-ish and you are lucky enough to receive the invitation of all invitations to a real summer camp out. The envelope alone would cause me to take pause. How often do you get a map as an envelope? 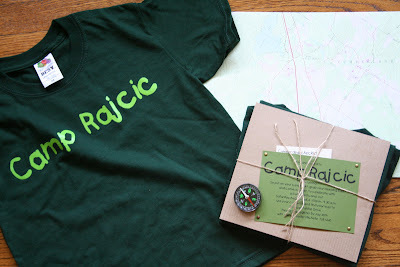 Included inside is a t-shirt for the birthday boy's guests to arrive in (printed with the official 'camp' name, of course). 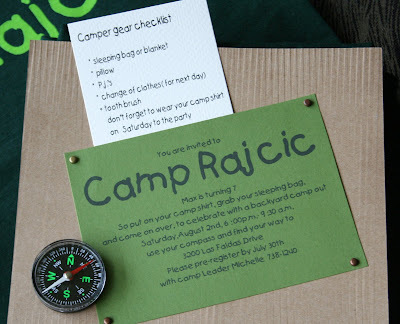 A compass is included to help each camper 'find their way' to the bash. Finally, she adds a camper checklist to make it easy on what will likely be a group of first timers. Every last detail, people! I can assure you these boys will not have another camping experience like this one. She is setting the bar high for them, but that's what I like about Miss Michelle. She takes it to the Max. This is beyond cute, I'm going to have to put this in the brain file for when my boys get a little older. I need to hire Michelle for her services. Seriously, considering how crazy people are about kids parties these days, she should try getting hired! 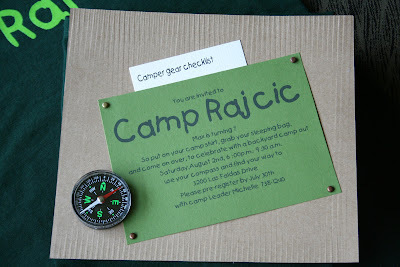 Oohh...I'm looking for inspiration for a camping-inspired birthday party. I love those invitations in the first image. Fabulous. You are absolutely right, your friend should have a blog! Having a camping party for my son in May and these are GREAT ideas!! What size envelope did you use in order to fit the t-shirts? 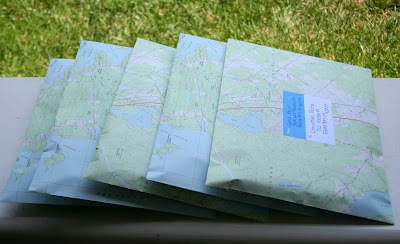 I used a 9x13 map envelope. The envelope was a little bit bigger than what was in the inside, but everthing arrived neat and intact. Good luck with you party in may, this one is so much fun. I love this theme and so does my daughter! We are definately going to use this theme for her 11th birthday party in May. We are off to search for the corrugated cardboard look paper today. A quick question...do you remember what font you used for the invites? It is such a fun font! Sorry for the delayed response. The font is "catsup". Have fun with the party! Love this! Using your genius idea as a jumping off point for my step-daughters weekend camping birthday party! Were you able to find the corrugated cardboard and tacks/grommets at Michaels? where did you purchase the envelopes from? I can't find ones that are similar to yours.